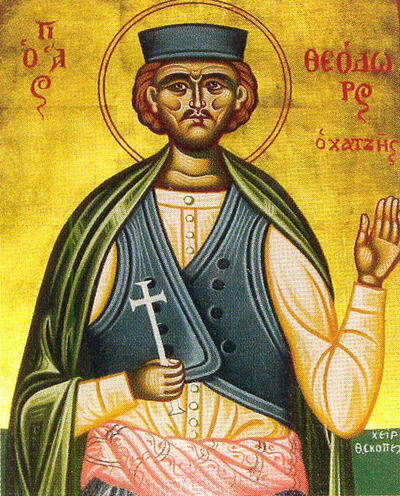 The Holy New Martyr Theodore was born in the city of Mytilene, where he married and raised children in Orthodox piety. He renounced Christ and accepted the Moslem religion, but soon repented of his sin, left his family and went to Mt. Athos. 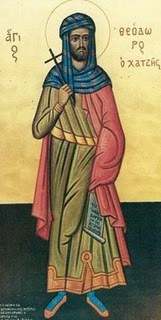 But even in the monastery St Theodore was deeply anguished by his denial of Christ. The Lord blessed the saint to confess the Orthodox Faith before a Moslem judge in the year 1784. The enraged judge gave orders to fiercely torture the holy martyr, and then they strangled him with a rope and cast him into the sea. 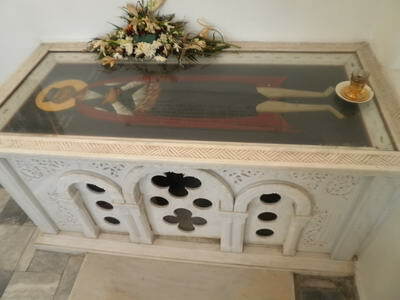 Christians buried the body of the holy Martyr Theodore in the church of St John the Forerunner.